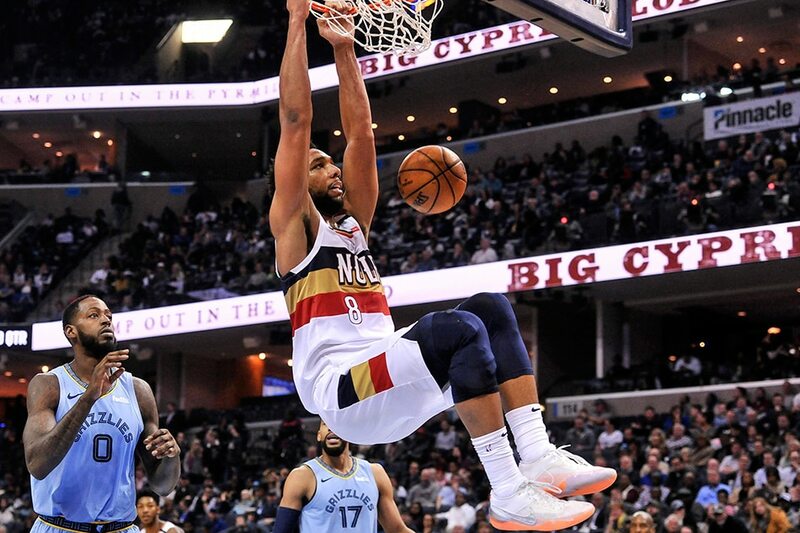 No Anthony Davis, no problem for the New Orleans Pelicans, as the visitors routed the Memphis Grizzlies 105-85 on Monday in their first game without their injured All Star. Davis suffered a sprained left index finger in a loss at Portland on Friday night and is expected to miss a week or two. Jahlil Okafor earned the start in place of Davis and made the most of it, scoring 20 points on 9-of-11 shooting and pulling down 10 rebounds. Jrue Holiday and Nikola Mirotic each scored 21 for New Orleans. Mirotic made five 3-pointers off the bench. Julius Randle also scored 20 and pulled down a team-high 12 rebounds. Memphis' Marc Gasol led all scorers with 22 after missing the team's last game with a sore back. Mike Conley added 20 in the loss. It was tale of two halves behind the 3-point line for the Pelicans, who hit just one 3-pointer in the first half on 12 attempts. But they nailed eight 3-pointers in 14 attempts in the second to pull away from the Grizzlies, who lost their sixth consecutive game and 12th in the past 13. The Pelicans, just 7-19 on the road this year, salvaged the final game of their five-game trip to go 2-3. The game was tied 63-63 with 6:31 remaining in the third quarter, but the Pelicans outscored Memphis 42-22 the rest of the way. The 3-point shots started to fall for the Pelicans in the third, as they used a 17-3 run to lead 82-68 heading into the final stanza. The Pels went 4-for-6 from beyond the arc, with Mirotic connecting on three treys in the frame. The Pelicans took a 54-50 lead into the half on the strength of a 9-2 run to end the second quarter. Okafor led the team at the break with 13 on 6-of-7 shooting, plus seven boards. Holiday had 12 points and Randle 10. Conley paced the Grizzlies at half with 15, and Gasol had 13 but also three fouls. The Grizzlies led 28-21 after the first quarter on a Conley 3-pointer at the buzzer. They led by as much as nine.